Planning a potluck can often be a challenge since organization is a must. Having a sign up sheet available for participants to write in the items that they plan on bringing helps simplify the process. Sign up sheets keep you organized and will ensure that all menu items, from side dishes to desserts, are covered. Place the sign up sheet in a location that is easy to access and will be seen by all attending the potluck. You can keep up on who is bringing what item and remind those attending about what food or supplies that they will need to bring to the potluck. The printable will help you stay organized throughout the planning process. If you need help downloading the sheet, check out these helpful tips. This sheet has areas where attendees can write in their names and what food they plan on bringing. You can also edit it on your computer, allowing you to keep and update information on your computer easily. Keep and Share: This site has a free printable and is easy to use; you can print the copy available or copy and paste into your own document. The sheet requests the person's name, phone number, email, and item s/he is bringing. There are 30 lines to use. To get to the sheet, follow the last link at the bottom of the text with red arrows. Free Microsoft Word Template: This basic sheet can either be printed and filled in by hand or saved to your computer. It has an area at the top to fill in the potluck details. Below are two columns; one is for the person's name and the other is for the dish s/he is taking to the event. 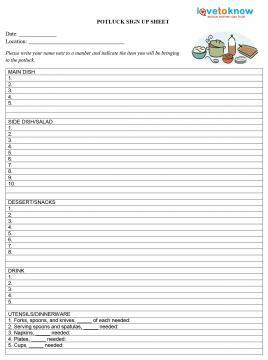 Sheet Templates: This sign up sheet has a space for a name and menu item, as well as for how many people will be attending the potluck from that person's family. It can be saved to your computer or printed and filled in by hand. 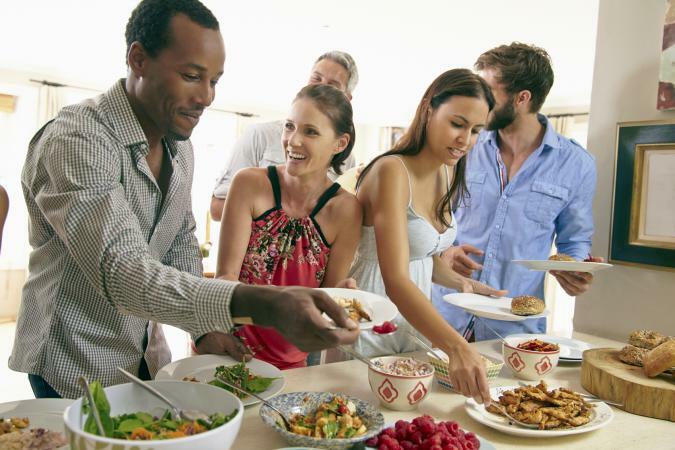 If you're hosting the potluck, it is up to you what you want to provide. If you plan to provide the tableware, indicate it at the bottom of the sheet. Otherwise, be sure to have an area for utensils, napkins, and cups on your sheet, with an approximate number of each needed. Always guess above what you think you'll need to be on the safe side. When using a sign up sheet, keep it as simple as possible. You will want it to be obvious as to what items are still needed and who is responsible for specific dishes and tableware.